David James Archuleta (born December 28, 1990) is an American singer-songwriter, musician, and actor. At ten years old, he won the children's division of the Utah Talent Competition leading to other television singing appearances. When he was twelve years old, Archuleta became the Junior Vocal Champion on Star Search 2. In 2007, at sixteen years old, he became one of the youngest contestants on the seventh season of American Idol. In May 2008 he finished as the runner-up, receiving 44 percent of over 97 million votes. In March 2012, Archuleta released his fourth album, Forevermore, exclusively in the Philippines. This was his first Original Pilipino Music album, composed of several covers of Filipino songs. The album was certified gold in the Philippines (10,000 units) as of June 2012. Archuleta's fifth album, Begin, was released on August 7, 2012, in the United States. His sixth album, No Matter How Far, was released on March 26, 2013. Archuleta was born on December 28, 1990 in salsa singer and dancer, and Jeff Archuleta, a jazz musician. His mother is from Honduras and his father is of Spanish–Basque, Danish, Irish, German, and Iroquois descent. He speaks fluent Spanish. Archuleta has four siblings. His family moved to the Salt Lake City suburb of Sandy, Utah when he was six years old. He now lives in Murray where he attended Murray High School. Archuleta earned his Eagle Scout award in 2010 of the Boy Scouts of America. When Archuleta, a member of The Church of Jesus Christ of Latter-day Saints, was 21, he volunteered for two years as a full-time missionary in Santiago, Chile. Archuleta is also a graduate of Barbizon Modeling and Acting School in Salt Lake City. Archuleta started singing at the age of six, inspired by a Les Misérables video. "That musical is what started all of this," he said. He started performing publicly at age ten when he participated in the Utah Talent Competition, singing "I Will Always Love You" by Dolly Parton; he received a standing ovation and won the Child Division. In 2003, when he was twelve years old, Archuleta sang on several episodes of the television show Star Search. He ended up as the Junior Vocal Champion on Star Search 2, losing the Junior Grand Champion title to Tiffany Evans. On one episode, he sang against then-11-year-old Alexandréa Lushington, who became a "top 20" semi-finalist on American Idol alongside Archuleta. Around the second year of being on Star Search he started focusing on the lyrics, "I didn't even pay attention to the lyrics when I was 12, 13". Archuleta's competing on Star Search was preceded by an appearance on The Jenny Jones Show, meeting the finalists from American Idol's first season, for whom he performed a spontaneous a cappella rendition of "And I Am Telling You I'm Not Going" from Dreamgirls. He received praise from Season 1 winner Kelly Clarkson, and the episode led to appearances on CBS's The Early Show. The year after Star Search, he found out he had partial vocal paralysis but declined risky surgery and has said he feels he is almost fully recovered. He limited his singing for specific occasions like Stadium of Fire, the Independence Day celebration at Brigham Young University Stadium. Archuleta made initial attempts at songwriting and arranging music after his Star Search experience and has written at least three songs. His first singles in 2002 written by his father and Sunny Hilden "Dream Sky High" and a song he had written by Yani Gileadi "Don't Tell Me". Archuleta received his ticket to the Hollywood auditions at the San Diego tryouts – held at Qualcomm Stadium at the end of July 2007 – with a performance of John Mayer's "Waiting on the World to Change" with judge Randy Jackson spontaneously joining in to sing the background "waiting" in the song. He was sixteen during the Hollywood auditions and attended school while a part of American Idol's seventh season. A parent/guardian was required to be there because he was a minor. Archuleta also took advantage of the decision to allow contestants to play musical instruments when he accompanied himself on piano for his performances of "Crazy", "Another Day in Paradise", and "Angels". During the 1970s themed week Archuleta sang the John Lennon song "Imagine", omitting the earlier verses in favor of the last one. Los Angeles Times columnist Ann Powers speculated that he wanted to avoid singing "no religion too" because of his faith. "As a Mormon, he's unlikely to espouse the song's agnostic ideal", she wrote. However, he did sing the entire song on Good Things Utah when he was thirteen. When asked by judge Randy Jackson why he didn't sing the first verse, Archuleta said the third verse was his favorite because it has "a great message." After his performance of "We Can Work It Out", which judge Simon Cowell called "a mess", Entertainment Tonight reported that Archuleta was feeling pressure from his father, Jeff Archuleta, who "reportedly yelled at" his son after a recording session the previous night. Jeff Archuleta, in an interview with Us Weekly, denied the claim. A May 2008 Associated Press article reported that Jeff Archuleta had his son add a lyric from the Sean Kingston song "Beautiful Girls" into an interpretation of "Stand by Me" (from which "Beautiful Girls" samples its bass line), increasing the costs for licensing, and that this had resulted in Jeff Archuleta being banned from American Idol backstage rehearsals. Archuleta defended his father calling him "a great guy" who keeps him grounded. During the Top 7 results show, the contestants were split into two groups. In one group was Syesha Mercado, Brooke White, and Kristy Lee Cook. In the other group was David Cook, Carly Smithson, and Jason Castro. Archuleta was the only one not sorted into a group. He was declared safe after the groups were formed, then was asked to choose the group he thought was safe. He refused, and sat down on the floor of the stage, much like Melinda Doolittle had done the previous season. In the finale he sang "Don't Let the Sun Go Down on Me", "In This Moment" and "Imagine". Judge Simon Cowell declared that Archuleta won the evening and even David Cook, who ultimately won, thought Archuleta would win: "I have to concede it, the kid came out all three songs and nailed it", said Cook. In the final tally, Archuleta received 44 percent of the votes. During the finale show, identical commercials featuring Archuleta and fellow finalist Cook mimicked the Tom Cruise scene from Risky Business where he dances in his underwear playing an air guitar; they were promoting the game franchise Guitar Hero. (mentor: Neil Diamond) "Sweet Caroline"
Music of the Rock and Roll Hall of Fame "Stand by Me"
Producers' Choice "And So It Goes"
Archuleta's first appearances on music ranking charts were with the three songs he performed in the American Idol finale; "Don't Let the Sun Go Down on Me", "In This Moment", and "Imagine", debuted on the Billboard Hot 100 chart the week of June 7, 2008. "Imagine" entered at number 36 (giving Archuleta his first top forty hit), "Don't Let the Sun Go Down on Me" at number 58, and "In This Moment" entered at number 60. That same week he had three songs on Billboard's Bubbling Under Hot 100 Singles chart as well, where his versions of "Longer", "Think of Me", and "Angels" debuted at number 15, number 19, and number 24 respectively. In July 2008 So You Think You Can Dance, a dance competition reality show, Archuleta's cover of "Imagine" by John Lennon was the featured music for contestants Katee Shean and William Wingfield with their pas de deux performance. Archuleta signed with Jive Records in June 2008. His self-titled album, David Archuleta, was released in November 2008. His first single "Crush" was released in August 2008 on Z100, a New York radio station. On August 12 "Crush" became available on iTunes. It debuted at number two on the Billboard Hot 100, beaten only by Rihanna's "Disturbia". It was the best chart debut in more than 18 months. According to Nielsen SoundScan, the track sold 166,000 downloads in the first week in the United States. It has sold 1.92 million digital copies in the US. Along with American Idol winner David Cook, Archuleta placed second on Forbes' list of "Breakout Stars of 2008". The two co-presented an award at the 2008 Teen Choice Awards in August 2008. Archuleta also received the Teen Choice Award surfboard for "Most Fanatic Fans". Archuleta signs autographs while serving as Grand Marshal at the Krewe of Caesar Mardi Gras parade in Metairie, Louisiana, on Valentine's Day, 2009. Since the release of his debut album, Archuleta has released three new songs: "Let's Talk About Love (The Build-A-Bear theme song)", "Save the Day (released only in Japan as a bonus track in his album)", and "Zero Gravity." In February, it was announced that Archuleta will be touring the United Kingdom supporting British band McFly on their "Up Close...And This Time It's Personal" tour. The tour began on April 21, 2009 and continued until May. Archuleta became the opening act for Demi Lovato's tour which began June 21, 2009. On April 22, 2009, Archuleta returned to the American Idol stage in its eighth season and performed the third single from his debut album, "Touch My Hand". On April 30, 2009 he made his first UK television appearance, on The Paul O'Grady Show, performing "Crush" and chatting about his album, which was released there in May. In May, Archuleta and fellow American Idol David Cook, visited the Philippines. Two days later he made live appearances on two of GMA-7's shows, Sis and Eat Bulaga!. He also confirmed that month that he was working on two new albums, his sophomore pop album and a Christmas album. In August 2009, Archuleta won three Teen Choice Awards for Breakout Artist, Love Song, and the Music Tour category with Demi Lovato. In September he won the Year in Music – Rising Male Star award at the ALMA Awards and performed a cover of the standard "Contigo en la Distancia". Archuleta's acting debut was when he appeared as himself on Nickelodeon's show iCarly titled "iRocked the Vote". The episode aired February 7, 2009. He made a special guest appearance in Season 3 of the Disney Channel show Hannah Montana In the episode "Promma Mia" as himself and he sang a duet: "I Wanna Know You" with Miley Cyrus who plays title character. The song was featured on the soundtrack Hannah Montana 3 and also appeared later on the compilation Best of Hannah Montana. On May 16, 2009, Archuleta and David Cook performed in the Mall of Asia: Concert Grounds for their Back-to-Back Concert in Manila, Philippines. On June 1, 2010, Archuleta released Chords of Strength: A Memoir of Soul, Song, and the Power of Perseverance, a memoir which refers to "the partial vocal paralysis he suffered in 2004 but has now fully recovered from". He went on a book signing tour beginning in Ridgewood, New Jersey. The book was a bestseller. Archuleta came back to the American Idol stage on April 7, 2010 on the show's ninth season and performed John Lennon's "Imagine", which David had performed previously in the Top 20 Week when he was a contestant on the show. After his performance, he mentioned that he was working on his third studio album. Archuleta sang "The Star-Spangled Banner" and "Stand by Me" at the 30th anniversary of the annual A Capitol Fourth concert in Washington, D.C. on the Fourth of July. The show was aired on PBS at 8pm EST live and tape delay PT. 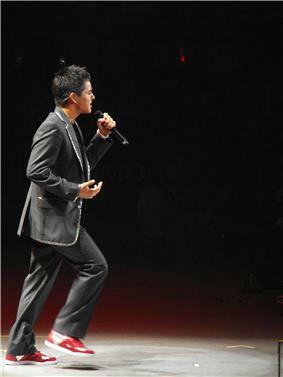 Archuleta sang live at the Tejano Music Awards covering Selena's songs, Como La Flor and No Me Queda Más at the event as a tribute on July 11, 2010. In an interview with AOL's Something Pitchy, Archuleta revealed that the release of his next album was planned for Fall 2010 (he did mention a late September release, but then went back to the Fall). On June 24, 2010 Jive Records announced that his new single would be released on DavidArchuleta.com on July 13, and iTunes on July 20. However, on June 30, 2010 the full version of "Something 'Bout Love" became available to play on his website. His album The Other Side of Down was released on October 5, 2010. On October 7, 2010, it was announced that David Archuleta would be the guest star at the annual Christmas concert of the Mormon Tabernacle Choir. Archuleta sang in performances on December 16–19. On September 6, 2011, Glad Christmas Tidings, a concert CD and DVD of the choir and Arhculeta's performance was released. On February 18, 2011 it was announced by Jive Records that David Archuleta had been released from his contract with them. 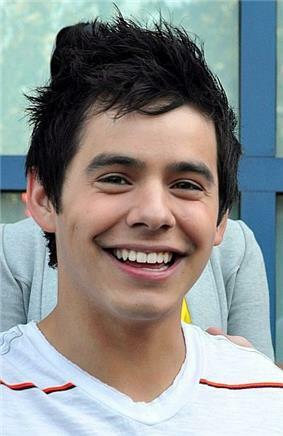 It was also announced on February 17, 2011 that Archuleta left his management Wright Entertainment Group. Archuleta intends to spend time working on writing original material. On July 2, 2011, Archuleta joined Brad Paisley to perform at the Stadium of Fire, where he performed the national anthem in addition to his five song set. From July 16 to 26, 2011, Archuleta toured Asia, performing in Indonesia, Philippines, Vietnam (Hanoi and Ho Chi Minh), and Malaysia. At the conclusion of the December 19, 2011 show of the My Kind of Christmas Tour, Archuleta announced his intention to serve as a missionary for The Church of Jesus Christ of Latter-day Saints for two years. He stated that he would return to music upon the completion of his mission. In early 2012, Archuleta signed a contract with TV5 to shoot a prime-time mini series in the Philippines titled Nandito Ako (Here I Am), which was broadcast from February to March 2012. An Original Pilipino Music album was released in March 26, 2012 in the Philippines, titled Forevermore. This album contains covers of classic Filipino songs, including "Nandito Ako" by Ogie Alcasid, "Forevermore" by Side A, and South Border's "Rainbow". As announced at the end of 2011, Archuleta would serve a two-year mission for The Church of Jesus Christ of Latter-day Saints. The singer, who has reportedly been assigned to Chile, entered the Provo, Utah Missionary Training Center on March 28, 2012. On August 7, 2012, a pre-recorded album titled Begin was released in the United States. The album consists of cover songs as well as a new original track titled "Broken". On February 12, 2013 a new song called "Don't Run Away", which had leaked online back in October 2012, was released on iTunes as the lead single from Archuleta's second release while serving on his mission. The album titled No Matter How Far, which consists of tracks previously only available in Asia and two newly released original songs, was released on March 26, 2013. Archuleta confirmed on March 24, 2014 that his mission is now completed and he is back home in Utah. Archuleta embarked on a Military Tribute Tour. Archuleta has been reportedly shooting a music video in Costa Rica for an untitled track following a tweet from his manager Kari Sellards attached with a picture that shows sets for shooting concluded with hashtag #DA2014, which fans have been tweeting on his absence for 2 years. On September 25, photos surfaced online at the set of the music video shoot, which is as of that moment, title remains unrevealed. The said song and it's music video will debut on February 12-15, 2015 to perform at RootsTech 2015 with comedy sketch group Studio C. On September 28, he released a new single as a free download titled "Glorious". The song was used in the motion picture Meet the Mormons. Along with denim to homeless teenagers nationwide. In January 2010, Haiti was hit with a major earthquake. On January 22, 2010, Archuleta joined other celebrities for a 2-hour fundraising telethon where he answered phones, and even stayed longer afterward to keep answering the phones. In January 2011, Archuleta travelled to Chennai, India with Rising Star Outreach, a non-profit charity giving children from leper colonies a first-class education and a chance at a future in India. Archuleta was one of the many Latino singers who participated in Somos El Mundo, the Spanish version of "We Are the World 25 for Haiti". The song and video premiered on the Cristina Show in March 2010, funds raised benefit Haiti relief. Archuleta's mother is from Honduras, and much of the music he listened to as a child was Latin-influenced, including watching his mom sing at events with her sisters. She also "was big on dancing" according to Archuleta, and would "make" him dance to traditional music with his older sister. He also listened to jazz music, he said, from his father's collection as well as gospel, pop, rock and "soulful music." In a later interview, he revealed that his father was a jazz musician. Archuleta also said he enjoys Broadway musicals. On his American Idol "Fast Facts" page, Archuleta cited his musical influences as Natalie Cole, Stevie Wonder, Kirk Franklin and Bryan Adams. Like Elliott Yamin and another singer he admires, John Mayer, Archuleta tries to infuse his pop selections with a soulful vibe. In a Seventeen interview, he cited Sara Bareilles as a clever singer-songwriter whom he looks up to. The Ellen DeGeneres Show Himself/Guest Interview and live performance of "Crush"
2010 Tosh.0 Himself Cameo "Episode 21 - American Idol Girls"
^ The performance of Gnarls Barkley's "Crazy" wasn't aired due to licensing issues with American Idol and the original artist(s). ^ John Farnham released "You're the Voice" in 1985; it was re-arranged and released as a cover version by David Foster with vocalist Jeff Pescetto in 1990. 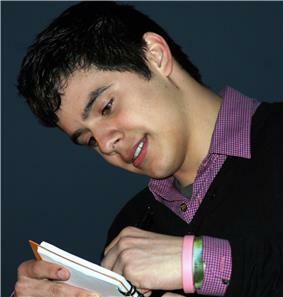 Archuleta was born that same year so was able to use it for the week's theme – "Songs from birth year of contestants". ^ CBS. CBS. Retrieved on 2011-02-23. ^ Demi Lovato to launch tour with opener David Archuleta | News Briefs | EW.com. News-briefs.ew.com (2009-04-15). Retrieved on 2011-02-23. ^ David and David – American Idols: CONGRATULATIONS ARCHIE!!! (TCA '09). Anangelandacookie.blogspot.com (2009-08-11). Retrieved on 2011-02-23. ^ Burger, David. Print Email Font Resize Archuleta returns to Utah for holiday concerts, The Salt Lake Tribune, 19 November 2009. ^ David Archuleta at the Tejano Music Awards 2010 – Updates here. » DAVID ARCHULETA | DAVID ARCHULETA FAN SCENE. Archuletafanscene.com. Retrieved on 2011-02-23. ^ Jive Music (JiveMusic) on Twitter. Twitter.com. Retrieved on 2011-02-23. ^ David Archuleta the guest star at Mormon Tabernacle Choir Christmas concert. Deseret News (2010-10-07). Retrieved on 2011-02-23. ^ David Archuleta Explains Break From Jive, Management Company (Video) – Idol Worship. Hollywoodreporter.com. Retrieved on 2011-02-23. ^ View Co-Hosts Dish to OK! About Sherri – OK! Magazine – The First for Celebrity News. OK! magazine (2007-09-06). Retrieved on 2011-02-23. ^ Cantiello, Jim. "David Archuleta Sings For Haiti, Superfans Raise Big Bucks", MTV News, 26 January 2010. ^ Shirley Halperin, "Catching up with David Archuleta", Los Angeles Times, 8 March 2010. ^ Alma Awards 2009: Teens Selena Gomez And David Archuleta Rule The Night. Thaindian.com. Retrieved on 2011-02-23.